This walk is a little challenging in places but the effort is most definitely worth it! 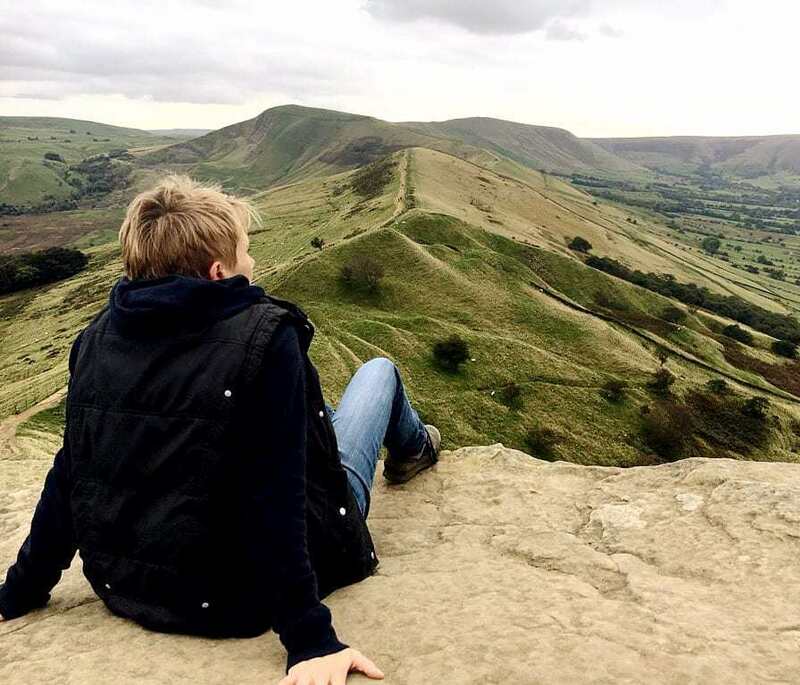 You pass through some of the most spectacular dales in the White Peak, where dramatic limestone crags tower above grassy slopes dotted with wild flowers. There are picturesque villages and shady woodlands en route, and the walk often meanders along the banks of the beautiful River Dove. This is a circular walk of 8 miles, along mixed terrain of hill trails and grassy paths. There are some fairly steep sections and a number of stiles. There is good parking at the start (not free) and the walk goes past a tea room and an excellent pub for refreshments if required. Give yourself 5-6 hours to complete this walk at a moderate pace, allowing for rest stops to take in the views. Park in the car park for the (now disused) Alsop-en-le-Dale train station, situated on the Tissington Trail just off the A515. 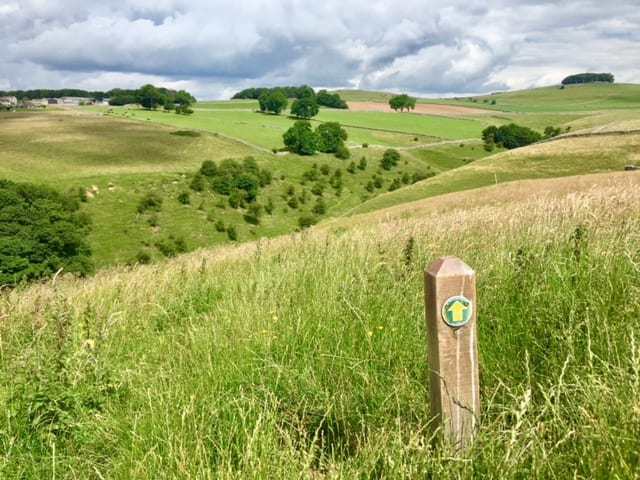 From the car park head north, signposted towards Hartington and Parsley Hay, and walk along the level, well-made track of the Tissington Trail. Walk under a bridge and ignore the first Public Footpath sign to your left. After approximately 15 minutes of walking, the Tissington Trail continues over a bridge but you need to look out for a Footpath sign pointing down to the left before you cross the bridge. Turn left to continue the walk, keeping the river on your right hand side. Follow the river downstream for about half an hour until you reach a pretty stone packhorse bridge, known as Viator’s Bridge, referenced in Izaak Walton’s famous book, ‘The Compleat Angler’, published in 1653. Join the quiet road here and turn right to cross the river, with the sign for Staffordshire in front of you. Instead of following the road onwards, however, take the little lane off to the left that is signposted for Milldale and continue with the river now on your left. Follow this lane into the picture-postcard perfect village of Milldale. 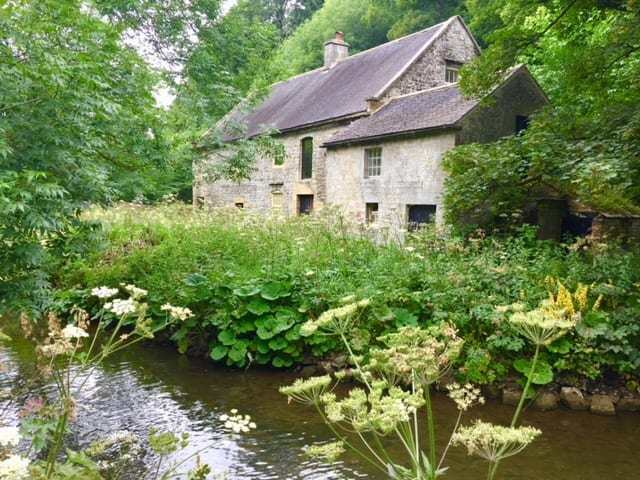 Here you will find Polly’s Cottage tearoom, serving sandwiches, hot snacks, drinks, cakes and ice cream, and it’s well worth pausing by the river to take a breather, although you will probably share the views with a number of other visitors to this very popular spot. There are public toilets here and a small National Trust visitor information centre. Leave Milldale by the lane that leads upwards out of the village past Polly’s Cottage and the red telephone box. It’s quite a steep climb but the views back make it worth the effort. 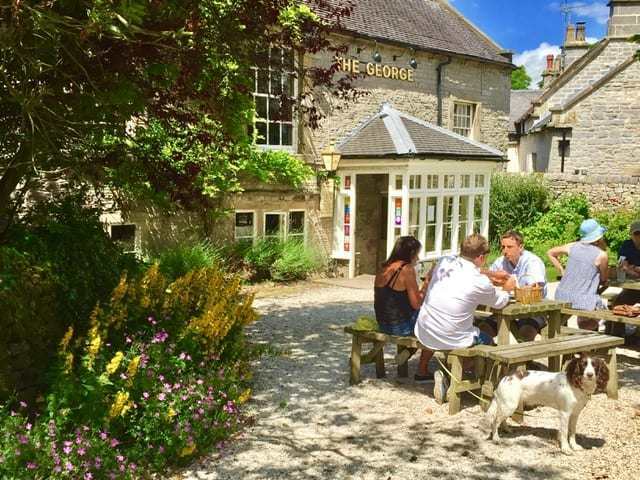 The lane leads into the equally beautiful and slightly larger village of Alstonefield, where you will find The George pub. This is a wonderful spot to rest and enjoy a well-earned meal or a drink. From The George, cross the village green and head slightly to the right, to follow the Footpath sign next to Bumblies Barn. Follow the well-marked field path through the fields and through a succession of gates, taking in the glorious views ahead of you. 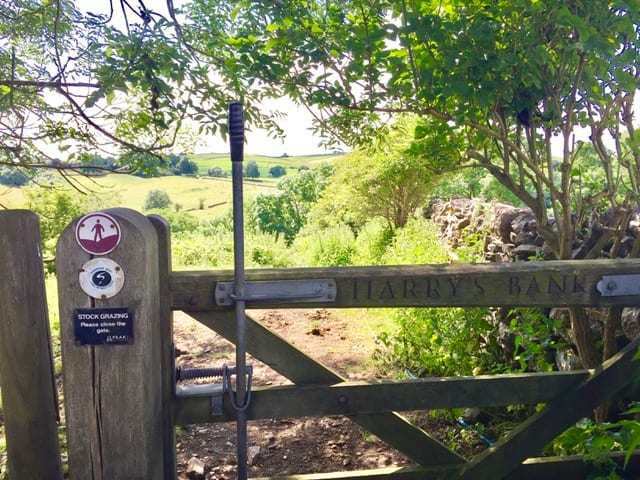 The path leads you between two dry stone walls through a wooden gate marked Harry’s Bank. Follow this path which leads steeply downhill – please tread carefully as the ground is very uneven and the rocks can be slippery where they are worn smooth. Once down the bank, you emerge on to a quiet lane. Cross over the lane and take the path immediately opposite that leads quite steeply upwards towards the little village of Stanshope. At the road junction bear immediately left by the Footpath sign on to a track, and after approx 100 yards turn right over a stile and into the field following another Footpath sign marked Dovedale via Hall Dale. You will see the dale ahead in front of you. 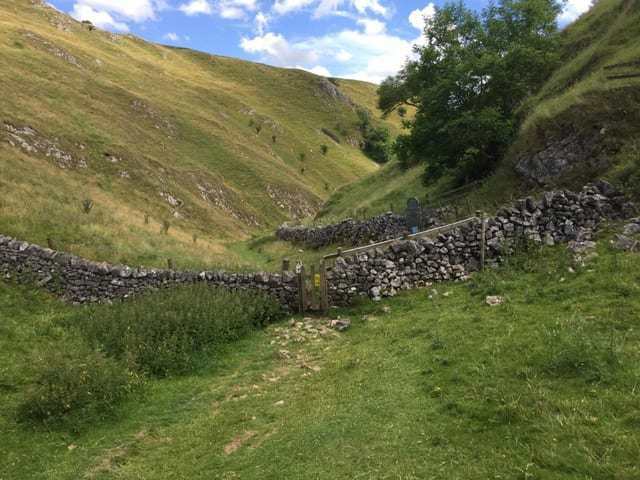 Follow the well-marked path into the glorious Hall Dale, a steeply-sided limestone dale dotted with wild flowers. Continue along this obvious path until you are greeted again by the River Dove. Turn right on the path alongside the river bank and look out for the very impressive limestone tower of Ilam Rock ahead of you, unmissable at over 25 metres high. Cross the river just before Ilam Rock, over the footbridge, and then turn left towards Dove Holes. Dove Holes is a system of large dry caves beside a bend in the river, well worth a short stop to explore. There is evidence of their use as shelters by prehistoric hunters in around 13,000BC and later as tombs by Neolithic farmers. This area is designated as a National Nature Reserve because of its abundance of wildlife, and it’s a very pleasant place to stop and admire the scenery. Continuing the walk, follow the path onwards for a short distance, keeping the river to your left, until you see a well-marked Footpath sign on the right that leads back to Alsop-en-le Dale. There is a fairly steep uphill section through trees here, but, again, rest assured that the views from the top are worth the climb when you emerge. At the top of the path go through a small gate beside a farm gate, and look out for a sign about 50 yards ahead of you in the field. Turn left here, with a large collection of farm buildings to your left, and follow the path over a stile and along the farm track. You have marvellous views over to the village of Wetton to your left. Continue along the farm track and cross one final field, to come out at the A515 and the entrance to Alsop-en-le-Dale station car park.